Apple Watch support (iOS 9 and watchOS 2 required). Fixed issues with average values in the player statistic view. In the Strokes by Course section, each course variant now contains 2 lines of values: The first line contains only values from rounds with all holes counted (no X scores). The second line (if applicable) contains values of all rounds (even those with X scores). Please also see the full list of changes in our Revision History. As opposed to most other golf scoring apps, there are still no hidden costs or annual fees in Birdie! There are no annual fees for accessing our course database. Our database contains data for tens of thousands golf courses around the world and Birdie grants access to all of this data without any hidden costs or annual fees! Birdie also doesn't contain any ad banners or similar annoyances. Birdie has been made with golfers' needs in mind. Birdie delivers all the features you'd expect from a golf scoring application and the user-friendliness and fun experience, you'd expect from a native iPhone application. 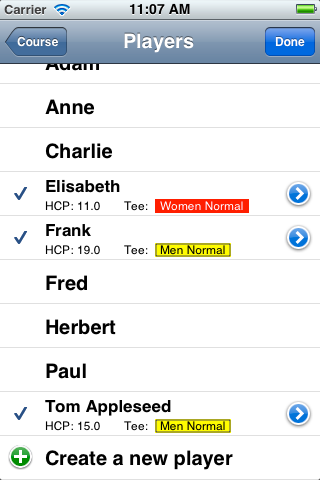 Besides the ease of use and speed (compared to traditional "handwritten" score cards, especially when it comes to calculating the results), Birdie provides many enhanced features like the built in range finder (with and without GPS)* or the fully automated calculation of score card results. Birdie not only counts each player's strokes during a game, it also automatically calculates the game's results according to different rules including "Stroke Play", "Stableford", "Par Event" and "AGS". When starting a round, you can optionally choose "practice mode". 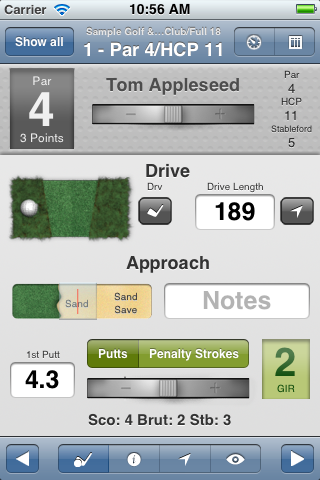 In this mode, you can track statistical data like putts, drive length (on iPhone 3G or newer by GPS), fairway hit etc. 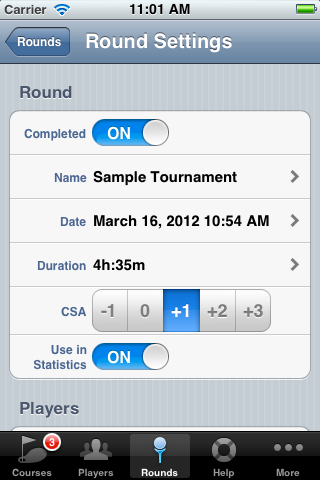 When starting a round as "Training Round", you can track statistical data like putts, fairway hit, drive length etc. This is possible for up to 4 players in the flight. Round setting like name and date can be easily changed. 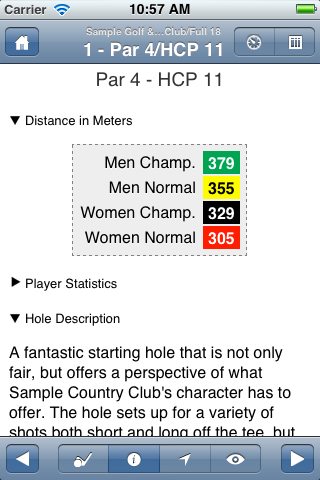 The course handicap for each player can be calculated automatically (based on the course rating and the player's handicap) or set manually - even after the game. * Hole descriptions are available for selected courses. 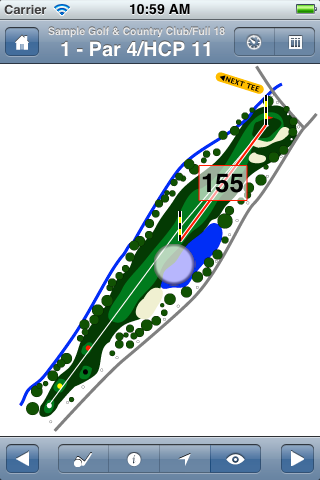 Birdie displays automatically statistics for each player on each hole. Birdie automatically generates sophisticated statistics for each player. 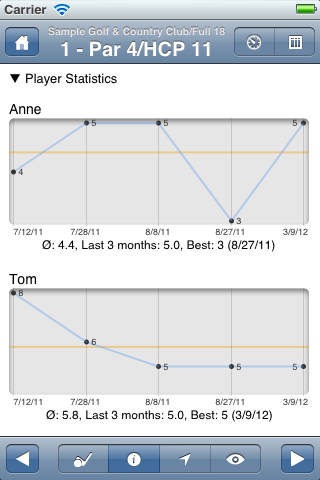 The player statistics can be filtered by course and time frame. Just play golf - let Birdie handle the book keeping stuff. Each player's individual course handicap is automatically calculated, accounting the handicap index, the course's slope rating (SR) and course rating (CR). Golf courses can be added to the database with the help of a online course editor. 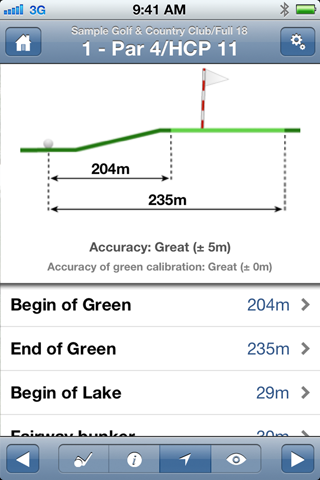 Once added, import course data via the internet (par, HCP, distance, course rating, slope rating etc.). Importing a golf course's data is very convenient: You can search by name, address or ZIP code and (in case you're currently on or nearby the course) by autolocating the course with the help of iPhone's location manager. When searching for courses by name, Birdie automatically tries to find nearby courses for the entered location. In case you cannot find a golf course, just choose "On-The-Go" when selecting the course to play. 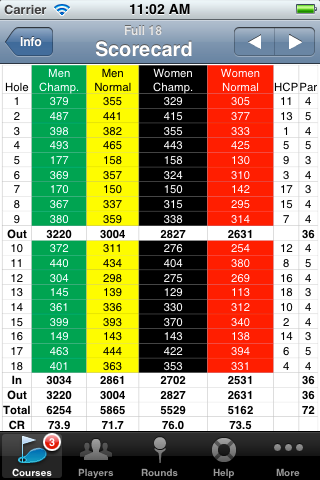 You then may enter the basic data for each hole (Par & HCP) during the game. After importing a course's description, all data is available offline. Birdie creates a full featured score card for each imported course. This data is also used to calculate your personal course handicap, the game result scorecards and so on. Choose up to four players per flight. Each player's individual course handicap is automatically calculated, accounting each player's handicap index, the course's slope rating (SR) and course rating (CR). If GPS data for a hole is present, Birdie's Range Finder shows the distances in a clearly arranged view. Tapping on one of the measurements opens a Google Maps view (see next picture). GPS data for courses can be easily edited in our Online Course Editor (if the course is visible in Google Maps' satellite views). Alternatively, the green's GPS position can also entered directly on the device, using the iPhone's internal GPS receiver. If GPS data for a hole is present, Birdie's range finder shows a Google Maps Satellite view of the area with overlaid distance information. The reference point for measuring the distance can be changed by simply tapping on its icon. An active internet connection is needed for this feature. * Map artwork is available for selected courses. Birdie focuses on golfer's needs. Instead of distracting you with fancy features, it provides all essential functions you'll need and expect from a golf scoring application in an easy to use and compact application. Send the game results via e-mail as HTML scorecards or as CSV files. 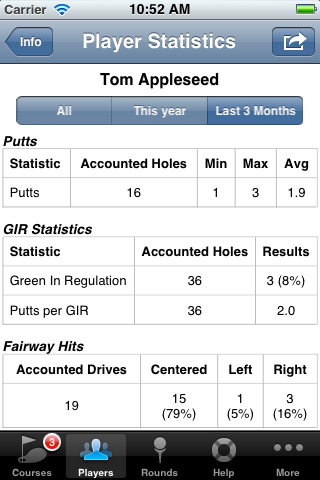 Print scorecards an player statistics on any AirPrint compatible printer directly from your device. Share scores via WLAN or Bluetooth connections with other Birdie users nearby. Sharing Scores doesn't need an active internet connection! To save time, you may add new players from the adress book. This also enables you to easily access a players contact information later. 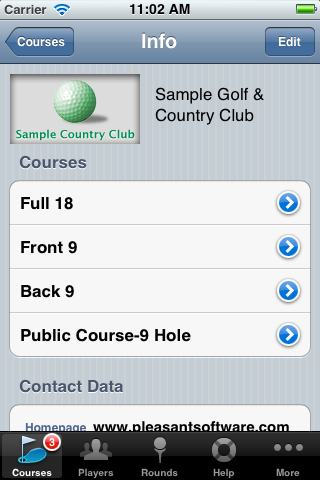 Imported course data also contains contact data of the golf club. Select the club's phone number to initiate a phone call on the iPhone; select the homepage url to open the page in Safari; select the address, to get the location in Maps; and so on. No more calculation errors. With Birdie you can access the scorecard for a round anytime with a single touch of your finger. Including round statistics. Use the "Send" button to send the game results via e-mail as HTML scorecards or as CSV files. With the Share Scores feature, it's possible to send played rounds to other Birdie users via WLAN or Bluetooth connections. The transmitted rounds are fully integrated in Birdie on the receiver's side, including player statistics etc. A common situation during a game of golf: The ball flew into the rough and isn't visible on first sight. 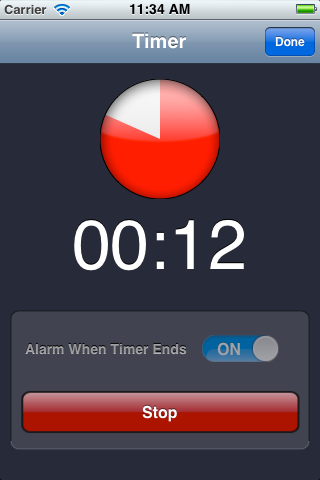 To assist you during the search, Birdie sports an easy accessible built-in search timer. Birdie is perfectly suited for use on an iPhone or iPod Touch during a game of golf: One of the biggest problems with all available web-based golf score applications is that they are mostly unusable due to no or very unreliable Wi-Fi and cell connections on most golf courses. Birdie is perfectly usable offline, which makes it well suited for the iPhone in low or no reception areas as well as for the iPod Touch. Access to data of more than 35,000 courses world wide. Count up to four players per flight. Track your strokes, putts, fairway hits, drive lengths and more. Automatic calculation of each players course handicap. Send game results by e-mail as HTML scorecards or as CSV files. 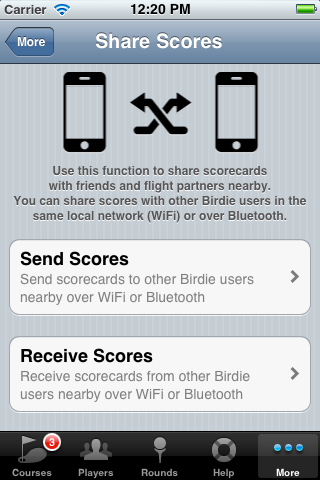 Share scores via WLAN or Bluetooth with other Birdie users nearby. Backup/Restore your Birdie data easily with your Dropbox. Any iPhone or iPod touch with OS 3.1.3 or newer. Birdie is usable out of the box without any additional software or data. In this case the user chooses the option "On-The-Go" when creating a new game. To experience Birdie's full capabilities, import the course data of the golf course you intend to play from our internet database. Once the golf course data has been imported, no further internet connection is needed to use this data during a game. If a golf course isn't available in our database yet, please use the course editor to create and publish it. * Map artwork is available for selected courses. A permission of the copyright holding golf club is needed for publishing map artwork. ** For GPS features an iPhone 3G or newer is required. 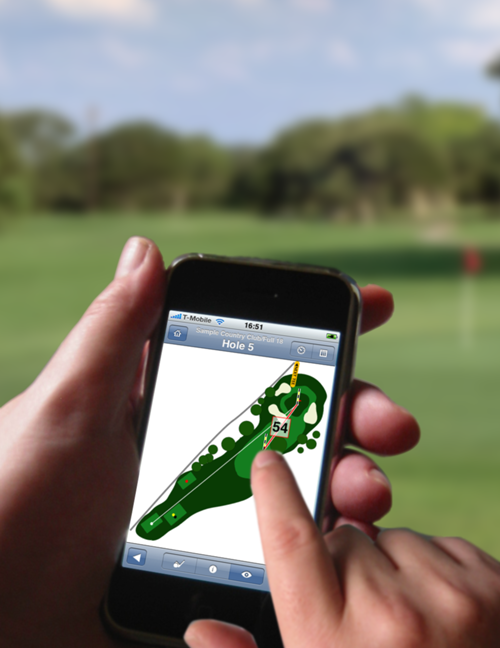 GPS data is available for selected courses. Please use our Online Course Editor to add GPS data for new courses.